If I am totally honest with myself, as an American, it's easy for me to get swept up by the anti-Muslim sentiments that fill up my social news feeds after events like Boston or Paris or San Bernardino. But when I am close to being swept up in the rush of closed doors, personal arsenals, and anger, I work hard to remember that before I am an American, I am a Christian. I know that Christ does not desire that any should perish, and I know that I am not given any wiggle room to hate anyone or desire their demise when they act out of their natural sin nature. But what should my response be in this turbulent world? How do I, and my brothers and sisters in Christ, show love to those who may turn one day and attack us? It's a balancing act, but when it comes to finding a Christ-centered answer to the issue of Jihad, former Muslim Nabeel Qureshi has done a fantastic job of giving us a starting point in his new book, Answering Jihad. 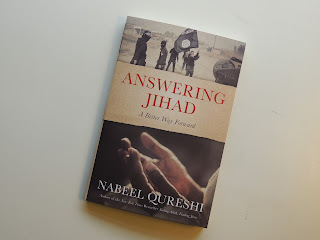 I was honored to be selected as a membert of the launch team for ‪#‎AnsweringJihad‬ (follow the hashtag on Twitter for more great links and reviews this week! ), and excited to have the opportunity to read an early review copy of this thought-provoking book. The answer really comes down to this: Christ sent us out as ambassadors, to be light to the lost, and to do so with love and without fear. This short book (just 173 pages - including appendixes and a sneak peek at his next book) gives someone like me (I don't debate or work in academia for a living) a simplified explanation of Islamic terminology and ideas that we hear and see thrown around in the news and online. Qureshi does an excellent job of providing a clear explanation of the differences between Islam and Christianity. He doesn't shy away from hot button issues like the Crusades vs. Jihad, and Old Testament warfare vs. Muhammad's fighting - the latter addressing (and answering) questions that I have struggled with in my own study of the Old Testament. I was impressed by Qureshi's efforts to keep his own feelings in check, presenting the facts in a clear, succinct way, and providing outside resource options if the reader wanted to know more or go deeper. I especially appreciated his openness in sharing that his Christian faith - and his own Muslim family members - would influence his perspective, and his clear delineation of his personal opinions vs. Gospel truth. There is a bias - openly admitted - but he leaves room for the reader to draw their own conclusions based on the simplified facts that he lays out in the book. Answering Jihad was good - definitely worth reading - but it was Qureshi's thoughts in his concluding chapter that really hit home for me. "We have to be walking with them before they arrive at the crossroads. This means being proactive, not reactive. It means living life with people who might be different from us. It means integrating communities and social circles. It means stepping out of our comfort zone and loving people unconditionally, perhaps even loving our enemies. And it means doing all this from a place of genuine love, not ulterior motives. [...] Fear is not a solution, as it will only alienate those we hope to deter from violence and it will serve as positive reinforcement to those who want to use terror. [...] We need something that breaks the cycle, and I think that can only be love. Not love as wistfully envisioned by teenagers and songwriters, but love as envisioned by Jesus, a decision to engage others as image bearers of God, to put their needs and concerns above our own, even at the cost of our own. [...] Without truth we will not be able to identify the real problem, and without love we will not be able to formulate an enduring answer. Regarding the latter, I think the first-century theologian Saul [Paul] was correct: even if we can fathom all mysteries and have all knowledge, it will not ultimately work without love." Bottom Line: To answer jihad, Christians must live out the love of Christ. Not easy, but all things are possible with God. Start with this book, be in continual prayer for wisdom, love, and opportunities to show it (to anyone around you - not just Muslims), and devote yourself to studying God's word so that when the time comes, you will be ready to give an answer for the Hope that you have.